A student leader and a vociferous orator, Muppavarapu Venkaiah Naidu is prominent personality in the Indian politics. He is the Vice President of India. He has been interested in politics since childhood. The plight of the common man, poor and the downtrodden are very well understood by Shri Naidu. He has worked hard for the people of his community and launched several schemes and a social service organisation "Swarna Bharath Trust" to serve the poor and the down trodden of his home town Nellore. He works poignantly for the concerns of the common man since his lower class family root enables him to empathies with the common man. M.Venkaiah Naidu was born on July 1st, 1949 to Late Shri Rangaiah Naidu and Smt. Ramanamma. He was born to agriculturist parents at Chavatapalem, a remote village in the Nellore district of Andhra Pradesh. On 14th July,1971 Shri. Venkaiah Naidu married Smt. Usha and they are blessed with a daughter and a son. He could deeply empathize with the problems of the common man especially the farmers and the people belonging to the backward class, as he himself belonged to the lower class family. He encouraged the party to adopt the slogan "Back to Villages". Since childhood Shri Venkaiah Naidu was interested in politics. He attended V.R. High School and in 1973 joined the ABVP as a student leader. Because of his outspoken nature and great communication skill Shri Naidu gained immense popularity. Shri Venkaiah Naidu's interest in politics is unsurpassable. He was interested in politics since childhood. He attended V.R. High School, Nellore. He pursued Bachelors degree in politics and diplomatic studies from V.R. College. From Andhra University College of Law, Visakhapatnam , Shri Naidu later on acquired a Bachelors degree in law with specialization in International Law. Being a vociferous orator he joined the BJP in his college days and was a swayamsevak in Rashtriya Swayamsevak Sangh. Shri Naidu is an avid reader and has published several articles in public and political interests. He has even authored a book titled Aluperugani Galam, Viraamamerugani Payanam. A brilliant orator and with a keen interest in politics, Shri Naidu joined ABVP as a student leader in 1973. He came into the spotlight for his prominent role in the Jai Andhra Movement of 1972. Shri Naidu protested against the Emergency, fought for the fundamental rights and was even imprisoned during the dark days of Emergency. He was a swayam sevak in the Rashtriya Swayamsevak Sangh and joined ABVP during his college days. Its the second time that Shri Venkaiah Naidu has served as the Cabinet Minister. He served as the National President of BJP from 2002 to 2004. 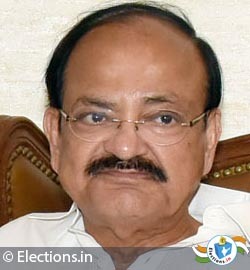 In the Atal Bihari Vajpayee government Shri Venkaiah Naidu was the Union Cabinet Minister for Rural Development (2002). To change the face of rural India, he had chalked out a three pronged strategy. By 2004, Shri Naidu had also setup 14 lakh Women's self help groups. He served as the Minister of Housing and Urban Poverty Alleviation, Urban Development and Information and Broadcasting in the cabinet of Prime Minister Narendra Modi. During his tenure he has launched several schemes and reforms for the development of the rural class. Pradhan Mantri Gram Sadak Yojna was one such scheme. He tried to rope in many multi national companies pertaining to rural development. Shri Venkaiah Naidu even initiated "Swarna Bharath Trust", a social service organization to serve the poor and the down trodden of his home town Nellore. He was nominated by the BJP for Rajya Sabha from Rajasthan and was elected. He fought against the forces of oppression and corruption. His contributed significantly towards the cause of the farmers, rural people and towards the development of the backward areas. He was the Minister of Urban Development, Housing and Urban Poverty Alleviation and Parliamentary Affairs from 2014-2017. He served as the Minister of Information and Broadcasting from 2016-2017 Recently he has won the Vice-Presidential Elections which were held on August 5th,2017. During his tenure, he launched many reforms and schemes for the development of the rural classes. One such scheme was 'Pradhan Mantri Gram Sadak Yojana'. He also tried to rope in multinational companies for the various projects related to rural development. To serve the poor and downtrodden of his hometown Nellore, Naidu initiated a social service organisation called 'Swarna Bharath Trust'. The trust provides education to the needy children. It also imparts employment training to women and the youth. He was the President of youth wing of Janata Party from 1977 to 1980. Member of Andhra Pradesh Legislative Assembly for two consecutive terms from 1978 to 1985. He became the General Secretary of the party in Andhra Pradesh in 1985. In 1988, he was appointed as the president of the state party. Naidu was thrice elected to Rajya Sabha from Karnataka and served a period from 1998 to 2014. Naidu served as a Minister of Rural Development from 2000 to 2002. In 2002 he was appointed as the National Party President. On May 26, 2014, Naidu took oath as the Union Minister of Urban Development and Parliamentary Affairs. On August 5, 2017, Shri Muppavarapu Venkaiah Naidu got elected as the Vice-President of India.